Manchester United caretaker manager Ole Gunnar Solskjaer (left) and assistant manager Mike Phelan (centre). Picture by PW Sporting Photography. Manchester United caretaker boss Ole Gunnar Solskjaer felt Brighton gave them more problems than the scoreline would suggest as they overcame the Seagulls 2-1 at home. United went 2-0 up at the break through goals from Paul Pogba and Marcus Rashford before Pascal Gross hit back for Brighton to ensure a nervy final 20 minutes for the hosts but the Red Devils held on for a seventh successive win under Solskjaer's tenure. This victory also saw the Norwegian become just the third manager in Premier League history to win his first six games in charge of a club, after Carlo Ancelotti with Chelsea and Pep Guardiola with Manchester City. After the game, Solskjaer spoke about how Brighton had made life difficult for his side as well as the respective performances of Marcus Rashford, who scored on his 150th appearance for the club, and midfield talisman Ander Herrera. "We made it more difficult than it should have been in the last 20 minutes. Up until then I thought we played some great stuff at times. 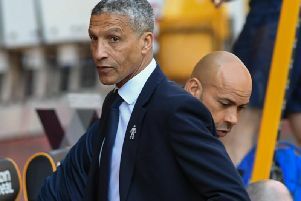 "As I've said many times, each game brings up different challenges and Brighton caused us more problems than other teams. "They're a physical side with good goalscorers. Gross has scored a few this season and I must say it was a good finish from the boy." "The players have to be proud of the form and momentum they are building. Seven wins on the bounce creates confidence and maybe in ten, 15 years I'll look back on this with pride. "I've never been bothered about these things but to be part of a team that has done it is great. The confidence and the team spirit kept them from losing points today even though David (De Gea) didn't have to make any saves. There were still scary moments. "The gaffer (Sir Alex Ferguson) used to challenge us with 'Why can't you win ten games on the bounce?' As long as we take one game at a time and we prepare well, any game should be a winnable one. "We've had some tough years at the club and we are sixth at the moment so it is a challenge to get where we as a club should be." "If the train keeps rolling and we can get loads of points on the board, then hopefully we can get higher up the table. Then again, we need to improve. "Defensively we need to find our shape better towards the end and we need to defend better with the ball. We were under the cosh and winning 2-1 today but we just needed to keep going and try to get hold of the ball. "I felt at times today that there was some fantastic football and we should have scored two or three." "There was loads more pressure at the bottom when I was at Cardiff. "You get more confident and you start trusting the boys more. You enjoy it more whenever you win games of football. "The pressure for us at a club like this is that we want to win every game we play." "You can argue for many strikers but I'm glad he's in my team. Harry Kane is injured so maybe that gives him a chance to be the best at the moment. "No one beats him on work-rate, no one beats him on attitude, and at the moment he's very confident in front of goal. He tries to shoot and he doesn't think twice about it. "He made a chance for Jesse (Lingard) and I cannot believe he didn't score that chance. I do believe he's playing the best football of his career." "He's a midfielder and he's a bit different to Paul (Pogba) and Nemanja (Matic). He runs and he runs and he wins the ball and he plays it simple and makes good runs in the box as well. "Hopefully he will continue like this. I've always enjoyed watching Ander play for United and I enjoyed watching him play against us (for Athletic Bilbao in the Europa League) as well."